MIRAMAR (July, 2017) – Thousands gathered to celebrate the grand opening of Miramar’s new, world-class Amphitheater at Miramar Regional Park on Tuesday, July 4th. Among the celebrants were City of Miramar’s Mayor Wayne M. Messam, Commissioners Maxwell B. Chambers, Yvette Colbourne and Darline B. Riggs. They were joined in part by Broward County Mayor Barbara Sharief, West Park’s Vice-Mayor Brian Johnson, Pembroke Pines Vice-Mayor Angelo Castillo, Lauderhill Commissioner Ken Thurston and several other dignitaries. 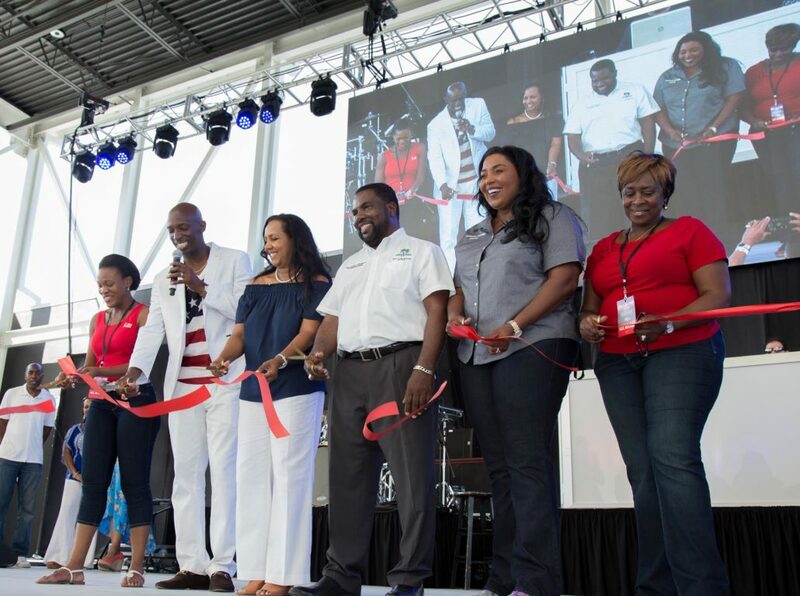 The Miramar Amphitheater was the perfect venue for a festive, free community Independence Day Celebration. Miramar resident and local singer, Shelby Williams kicked off the celebration with America’s National Anthem. The concert was hosted by JoMarie Payton from the 90’s hit show, Family Matters, and featured multicultural performers including six-time Grammy nominee Kelly Price, Canadian singer France Joli, Jamaican reggae fusion artist Wayne Wonder, Puerto Rican salsa singer Eddie Santiago and American R&B group Tavares. In addition, attendees enjoyed a variety of food vendors and a massive Kid’s Zone with life-size classic board games. The celebration commenced with a spectacular display of fireworks sponsored by the Memorial Hospital Miramar. The 5,000-seat capacity amphitheater is part of Miramar’s push to be a premier entertainment destination with a welcoming and inclusive approach to multicultural artists and the public. The City of Miramar will continue to partner with the Greater Fort Lauderdale Convention and Visitors Bureau on initiatives that position the City as a place for multicultural tourism in South Florida. The City of Miramar offers Ansin Sports Complex, Shirley Branca Memorial Park, Miramar Cultural Center ArtsPark and now the new The Miramar Amphitheater at Regional Park as sport and cultural entertainment assets within the City. All of them are easy to get to from Miami to Palm Beach and draws from over 6.7 million people across the region. To learn more about the City of Miramar, visit www.miramarfl.gov.